Your snowboard carries you down the hill until you and gravity suddenly launch your body into space. You twist in the air, hoping like crazy that your reacquaintance with earth is going to be the one you’ve visualized and not one that ends in the E.R. Some of us who watch the Olympics, ParaOlympics, or Special Olympics have no clue beyond certain falls we’ve taken in the past what it really feels like to launch into the air. As we watch TV, our imaginations make our muscles tighten until we feel exhausted by the time we give up and go to bed. In our house, we can’t help but remember the time when we watched our children flirt with airborne disaster. We had to hike across a frozen lake to reach the cabin, since the driveway was buried with snow. Even our teenagers didn’t complain. After all, we had been promised a real toboggan. We found it resting just inside the door. 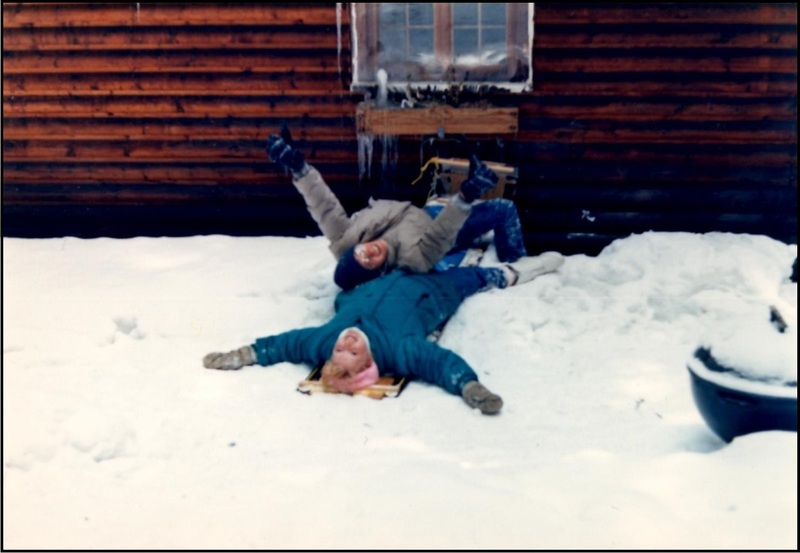 We didn’t waste much time bundling ourselves in winter clothes and trudging up the mountainside above the cabin, pulling the toboggan behind us. The dog danced in joyous anticipation and inside we were dancing, too. We spent a little time determining a path that wouldn’t collide with a tree. Then the kids climbed on the toboggan, situated themselves, and my husband and I shoved as hard as we could to begin the adventure! The run was less than exciting. The kids grunted down a few feet and stopped. The snow was too deep. Aside from creating a trench, they hadn’t accomplished much. We all set to work smoothing a track. We tugged each other back and forth on the toboggan. We were all sweating, and no one had laughed once. At last the track seemed to be acceptable. “Let’s try it!” exclaimed our son. Both kids climbed on board. The dog ran in circles in the footprints we had made during our many efforts. “Ready?” asked my husband. The kids were ready. My husband and I counted three and pushed as hard as we could. To our delight, the toboggan began to slide…slowly at first, then faster and faster and faster. The kids squealed. Now this was more like it! They went several feet and gradually stopped. “That was great!” cried our son. “Let’s do it again!” The kids pulled the toboggan back to the starting point. “Ready…set…go!” shouted my husband, and we pushed again. The toboggan moved more quickly this time. What a hoot! We were all laughing. But this time the toboggan didn’t stop. It picked up speed. It zoomed past the end of the run, hit a bump, and launched into the air. My husband swore. I couldn’t breathe. The toboggan was sailing directly toward the large window in the rear of the cabin. OMG. Our kids were about to be cut to ribbons. “Roll off!” I screamed. “Tip over!” shouted my husband. But the kids were in shock as they stared at the window before them. I’m not sure how the toboggan lost altitude at the last possible nano-second, but it did. It slammed into the side of the cabin with a huge thud. It was resting inches below the window. Everyone froze in place. “Are you okay?” I asked at last. I was imagining how long we would have to wait for an ambulance. The kids twisted in their seats. The color returned to their cheeks. They grinned and gave us a thumbs-up. “Can we do that again?” asked our daughter. Life launches us into the air every now and then. If we’re lucky, we can squint really hard to see our ultimate destination. But mostly, we can’t. We just hope we miss the window. Love this story. As a father it I understand those puckering, unable to breathe until it’s over moments. Incredible story. This entry was posted on March 2, 2014 by Personal Journeys with Gramma in Life Stories and tagged Adventure, Believing, Destination, Faith, featured, Future, Journey, Knowing the Way, Leap of Faith, Life Stories, Life's Journey, Life's Path, Olympics, ParaOlympics, Special Olympics, Trust, What's Next.